Mr. Michael Stojanovic was a former staff member at Collingwood Technical College where he taught sheetmetal and plumbing for approximately 17 years. 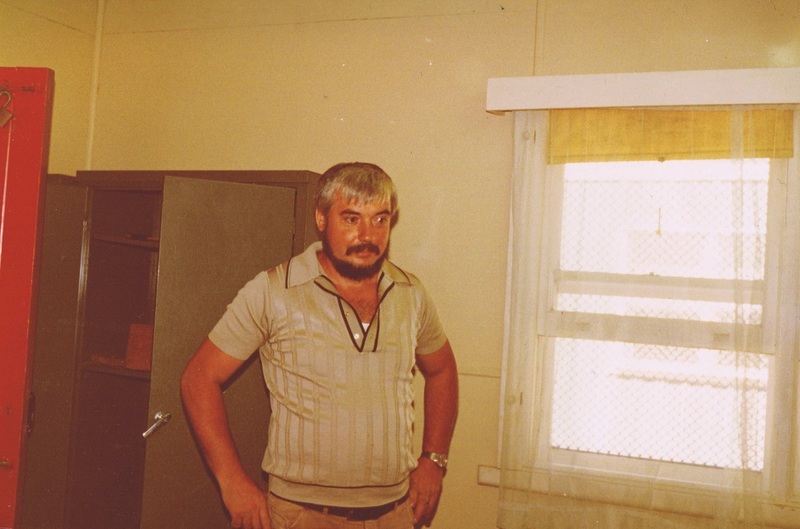 Mr.Stojanovic was also a Camp Coordinator at Buxton (a.k.a Camp Westlake) between 1980 to late 1988. "The leeches, they came from the run off of the shower block... We had a job to clear it every time we went down to Buxton. Dad was a plumbing teacher, we were the serfs. One plus was we got big worms for fishing . We would spend many a weekend as a family up at Camp Westlake. We also used to go down during the Summer holidays as well, (hence Dad's beard). " "We used to reckon the pet wombat that lived under the camp buildings for about 7 or more years looked like Mr. Barrett!" "We would often do maintenance, such as fixing the flying fox and other stuff. We even worked through the blackberries, which were a pain." ABOVE: Dad with his beard in front of the original students' sleeping quarters/kitchen. The kitchen was located towards the back of the building. The rooms had bunkbeds. ABOVE: Inside the original Alex Cowmeadow building (in the left hand front corner) before it was remodeled. job of catering for the family day in 1984. It was a great day!" ABOVE: 'Stoggy', as he was known by the students, testing the line of the flying fox. ABOVE: Testing the flying fox at Camp Westlake. Even after the camp's closure, Mr. Stojanovic's family still remained committed to the Camp. "Last we knew, the camp was under the care of DHS (Department of Health and Services). At that point it was in poor upkeep. We used to come and mow the lawn and stuff. The camp did suffer a real loss, especially the main kitchen and sleeping quarters. This was around the time the school was earmarked for closure." "Dad was an engineer, that is why he got into teaching. 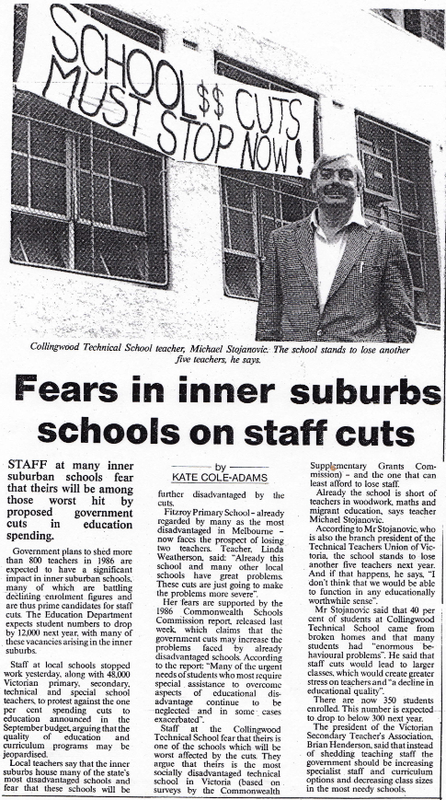 Collingwood Tech was his second appointment, he stayed there until about 1985." "After leaving Collingwood Tech, Dad went to Niddrie. The last school he taught at was Epping Secondary where he established a tech wing before retiring in 1994 to buy a farm down in the Western districts." "Dad's 'teacher's briefcase', was signed by Keith Haring on the completion of the mural. Dad's department paid for the paint. Mr. Collier, a coworker, was worried they would get canned by the Department because Dad and Keith went shopping at his paint supplier and purchased metal paint." Photo courtesy of Jelena, Mr.Stojanovic's daughter. Unfortunately, Mr. Stojanovic has since passed away in 2011 but he has left a lasting impression on Collingwood Tech and its students. All photographs kindly provided courtesy of Mr. Stojanovic's daughter, Jelena.